Rosedale Elementary School, Hillsboro, Ore.
Vancouver, Wash., company Sustainable Flooring Solutions worked with Hillsboro, Ore., general contractor Robinson Construction Co. to create a concrete placement method that successfully generated terrazzo-style polished concrete floors at Rosedale Elementary School in Hillsboro. "The more successful polish jobs we've had are when we've had preconstruction meetings," says Brad Sleeper, general manager at SFS. Working with an exposed aggregate concept proposed by Portland architecture firm Mahlum, the team placed a concrete mix that utilized a pea-gravel aggregate. The placement contractor installed the concrete by striking it off level, smoothing with a C-channel float and power-troweling to consolidate the surface. These methods kept the aggregate near the top and made it possible for Sustainable Flooring Solutions to get uniform aggregate exposure when they polished the floor. Starting with 60/80-grit metal-bonded diamonds, they achieved even exposure of the aggregate by the end of a grind at 150 grit. Next, they squeegeed a cementitious slurry mix of CTS RapidSet Cement All fortified with portland cement to fill voids left from the grinds. The floor was polished at 100 grit, 200 grit and 400 grit before workers applied AmeriPolish Raw Sienna dye and Lythic Densifier from Lythic Solutions. They finished out the project with an 800-grit polish and an application of Lythic Protector, also from Lythic Solutions. In total, Rosedale Elementary School now has 8,000 square feet of polished concrete, with 7,000 of it colored. "Originally it was going to be just 1,000 square feet of dyed color with the rest of the project looking natural, but they switched those numbers around," says Sleeper. "They really liked the color." Because Lythic Densifier does not have caustic residue that needs to be disposed of, the school was able to achieve additional LEED points. As a result, Sleeper says Rosedale Elementary is one of just a handful of schools in the country to meet the LEED Gold Standard. Bomanite of East Tennessee colored this anelemmatic sundial with Color Juice from American Decorative Concrete Supply Co. Photos courtesy of Bomanite of East Tennessee Inc.
Storm Grove Middle School, Vero Beach, Fla. Contractor: Bomanite of East Tennessee Inc. When the School District of Indian River County, based in Vero Beach, Fla., and St. Augustine architect Schenkel Shultz Architecture decided to make a new middle school LEED certified, decorative concrete was a natural choice. "The basis of the design is sustainability and it's built around LEED principles," says Schenkel Shultz project architect Johnnie Lohrum Jr., LEED AP. "Decorative concrete is a very green product, it's very low-maintenance, and it will save the school district a lot of money in the long run." Despite the 750-mile distance between its Knoxville headquarters and Storm Grove Middle School, Bomanite of East Tennessee Inc. was awarded the contract to provide the school's polished and stained decorative concrete floors. Having worked with the architect on a previous project, Bomanite was included in the bid process alongside Vero Beach general contractor Proctor Construction Co.
"As with all projects that we do out of town, you have to mobilize manpower, equipment and materials," says Bomanite of East Tennessee co-owner Kathy Killingsworth. "Even your best-laid plans don't cover everything involved. Additional shipping and trips to keep materials on the job site and equipment maintained and in working order were necessary but not unexpected." Additionally, the company rented a furnished house in Florida for the crew. "They felt more like they were going home than just back to a motel room after a long day of work," she says. Over three months, the crew was responsible for 104,310 square feet of polished and stained concrete and 14,604 lineal feet of decorative saw cuts. To begin the process, Bomanite first saw-cut designs as specified by the architect, cutting with 40-grit, 80-grit, and 150-grit metal-bond cutting diamonds. They then cleaned out all of the construction joints and decorative saw cuts, filling them with polyurea joint filler. Next, Bomanite cut the floor with a sequence of resin-bond diamonds - 100 grit, 200 grit and finally 400 grit. After densifying with Convergent Concrete Technologies' Pentra-Sil and dyeing the floors using AmeriPolish dyes in Sepia, Pine Green, Burnt Sienna and Raw Sienna, they polished with an 800-grit resin-bond diamond. Finally they applied Convergent's Pentra-Guard and ran one final burnish with an 800 HTC twister pad. In addition to the floors, Bomanite of East Tennessee was asked to complete a sundial in the center courtyard for the school's five buildings. This wouldn't be just a simple stamped pattern. It actually had to work. "One of the basic concepts of the school is to use the facility itself as a learning tool," says Lohrum. With that in mind, the architect designed an analemmatic sundial, which uses students' shadows and standing positions to tell time. Bomanite colored the sundial area per the architect's instructions using American Decorative Concrete Supply Company's Color Juice in Mahogany, Walnut and Sand. Despite the long distance, the project proved to be worthwhile for Bomanite. 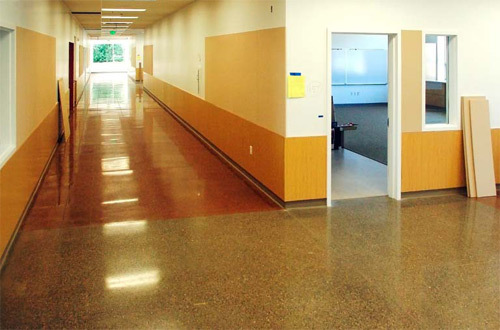 Another school in the district had VCT flooring, and after a moisture issue, Proctor Construction had Bomanite install polished concrete there as well. Photos courtesy of American Concrete Concepts Inc.
Billy Ryan High School, Denton, Texas. Contractor: American Concrete Concepts Inc. It's no big surprise that locker rooms can get dirty, and maintenance costs can get quite high on a floor that is constantly exposed to mud and cleats. 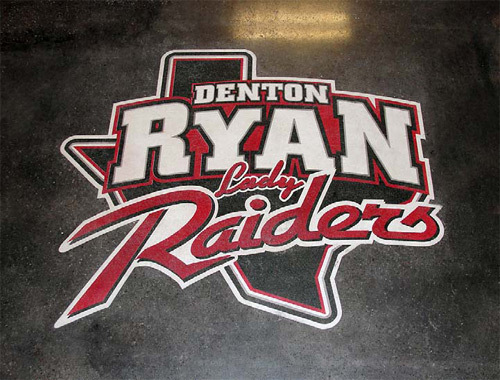 With that in mind, the athletic director of Billy Ryan High School in Denton, Texas, was looking for new floors that were easy to clean and maintain. "Once we showed them how we can dye concrete, that really tripped his trigger," says Mike Stoyanoff, American Concrete Concepts Inc.'s regional manager for Texas. "We went in there with multiple colors and logos on the floor. They never had that opportunity before." Originally the school was going to go with a different substrate, but Sloan Harris at Texas-based VLK Architects Inc. brought in the Arkansas-based concrete polishing experts at the last minute. In addition to eight locker rooms located in the school's updated athletics facility, ACCI polished an entire hallway with dramatic blue and gray colors. In total, the company polished about 40,000 square feet. Because some of the locker rooms had 40 years worth of old concrete pours, ACCI first had to do a deep grind to expose the existing aggregate. When it came time to polish the floors, they started with 80-grit metal diamonds. When they reached the 400-grit level, ACCI dyed the floors using Midnight Black and Patriot Blue colors from AmeriPolish. They then applied Retro Plate 99, a densifier from Retro Plate. They brought the polish up to 1,500 grit and stain protected the floors with Prosoco's Consolideck LS Guard. Because each coach at the school had control over the look of his or her locker room, the school's logo was installed each time in one of two ways. Some coaches preferred that the logo be dyed directly into the concrete, while others preferred the look of an overlay. Photos courtesy of Avani Concepts Inc.
Daniel Island Academy, Charleston, S.C. Although they may not know it, the students at Daniel Island Academy in Charleston, S.C., are using decorative concrete to learn. The school, which focuses on a concept called play-based learning, tries to make everything the students do count as a learning experience - even when they are on the playground. Chantel Renee, co-owner of Avani Concepts Inc. and parent of two Daniel Island Academy students, was asked to enhance the back play area. Previously it was just a regular concrete area. Now it offers bright colors, function, and learning opportunities. "It incorporates a lot of different aspects of child development into the project," she says. One of the area's highlights is a pond area complete with a sandy "beach" and numbered fish. Renee says the students have learned to stay out of the beach area, which visually marks the path taken by a nearby door as it opens. The fish have helped teach the students numbers and personal space. The creatures also give the kids a workout as they jump from fish to fish. To create the pond area, Renee and Avani co-owner Jerry Hunt stained the area with Engrave-A-Crete's RAC (reactive acid chemical) Stains and Sim Stain from L&M Industries. They added the fish by engraving each one from a stencil and coloring them using Concrete Resurrection Water Reducible Concentrate, also from Engrave-A-Crete. In addition to the pond, an existing concrete pillar was painted with water-based paint. It was designed to look like an aquarium, and the water from the pillar appears to be spilling into the pond area. Even the students became involved. "The kids helped in many ways, from drawing fish, to help us come up with the one we actually used, to showing us how far they could step or jump," says Hunt. Although this was a fairly standard project for Avani, which has offices in New York and South Carolina, Renee and Hunt did face a couple of weather-based challenges. "The weather was very hot," says Renee. "It was a challenge for us to work fast enough, as the paints dried really quickly. There was not much room for error." And even a summer project isn't safe from inclement weather. Hunt says they were at one point surprised by rain and wind that left them running to borrow tires from the playground to keep a cover from blowing away and exposing freshly stained concrete. "After not being able to sleep that night, we returned the next day to thankfully find a beautiful result and applied the sealer."